I ♥ Motherhood: Flashback Friday - Are my Festival Days Over? Now I'm pregnant with baby number 2 I've really started to think about how life is changing, I mean obviously it changed a lot with baby number 1 but now with another on the way it's dawning on me that things are definitely taking a different direction. And don't get me wrong I love the direction my little family is going in now, I love my husband more than anything, and my daughter is the love of my life and when baby boy comes he will be the icing on my very delicious cake. What all that brings with it though is the realisation that life will never be the same again, those carefree days will be limited to about 1 or 2 a year, when we can get a pass out by letting the grandparents take the strain for the weekend! 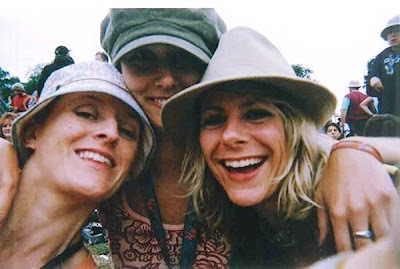 So all of that leads me on to why I chose this photo for Flashback Friday It was taken at V Festival in 2005 where I experienced my first festival (pretty shameful if you ask me at the age of 30 - but in my defence I was a bit of a dance fan and thought festies were too grungy!). I went with my best friend and my best colleague from work and we had a riot. This photo just shows us looking all chilled and really captures to me the great time that we all had together. It was the most fabulous weekend in August I'd had in ages and we just partied and danced and laughed the whole time. We saw plenty of bands, we danced in the dance tents, we drank our body weight in booze, we chatted and made friends, we pee'd in bushes and we just had the best girls weekend. Camping was a pretty new experience for me but even that brought it's share of laughter and a glass of red wine first thing in the morning always helps in those situations! We didn't look pretty by the end of it (one of us looked like she had birds nesting in her hair...) but the sign of a good time at that point in my life was feeling like death and gagging for a big greasy McDonald's on the way home. So however much I wouldn't change the life I have now, I fully appreciate the fun and frolics I used to have and hope that one day I will make a return to a festival - albeit maybe with some kids in tow and no red wine for breakfast! Why not check out the other Flashback Friday entries over at Cafe Bebe and join in! Thanks for linking up to Flashback Friday! thanks Karin, I love reliving memories, so FF is perfect! I don't plan anymore babies, so next summer might just be the ticket! Oh the Festivals and how I miss them too. I was there at V Festival in 2005 and camping too! Brilliant brilliant time. I also remember seeing couples with pushchairs there but i didn't like that idea myself. Love that photo. Aaaah, those were the days! That was such a good laugh, I have no regrets and when will I ever have the excuse to drink red wine of a morn again? Ah Rach, it's one of my fave photo's - we look fresh faced! And since the pelvic floors have been mentioned I'm furiously clenching and unclenching! LOL! After 7 festival free years I am considering Bestival this year! Youngest is now over 2 so a little bit of the good life is coming back to me! oh wow you lucky thing! So there is hope for me then!? I need to know your secret - how do you get free tickets to V?! I'm up for it next year - perhaps we should have a blogger camping trip!! I never went to a festival - just wouldn't be able to rough it and not have decent sanitation!